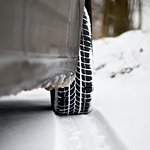 When the ground begins to get icy, slippery, and snowy, drivers need to have the right winter tires on their vehicles. As such, the team here at Wyoming Valley Kia has decided to put together a short guide to point you in the right direction. For areas where the temperatures get low but snowfall is rare, performance winter/snow tires are the best option. These tires were originally designed for use on European highways and do a wonderful job of improving traction without sacrificing vehicle performance. Of course, for towns and cities that see a lot of snowfall during the winter, a more rugged tire option is needed. Since studded tires are banned or restricted in some states, studless ice and snow tires are usually your best option. This tires provide ample control and traction over ice, snow, and just about anything else that winter might throw at you.